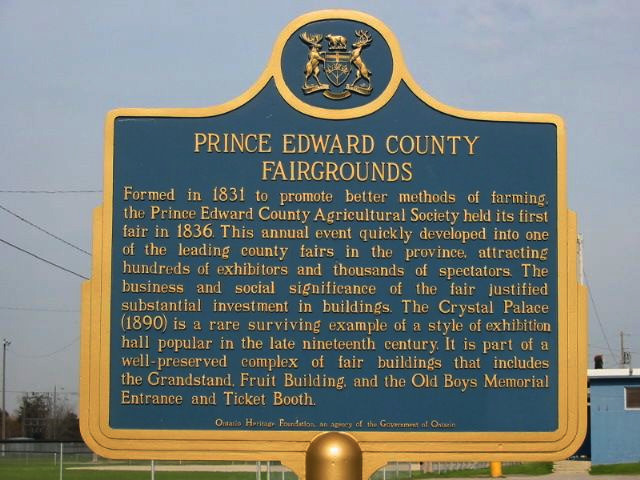 Formed in 1831 to promote better methods of farming, the Prince Edward County Agricultural Society held its first fair in 1836. This annual event quickly developed into one of the leading county fairs in the province, attracting hundreds of exhibitors and thousands of spectators. The business and social significance of the fair justified substantial investment in buildings. The Crystal Palace (1890) is a rare surviving example of a style of exhibition hall popular in the late nineteenth century. It is a part of a well-preserved complex of fair buildings that includes the Grandstand, Fruit Building, and the Old Boys Memorial Entrance and Ticket Booth.